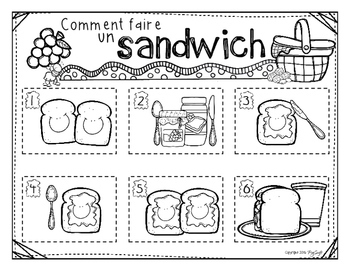 • Use the fun of making a sandwich to practice procedural writing and sequencing with your students with these interactive activities! • Differentiate by using the 6 pre-numbered sequential pictures or the ones that require students to figure out the order themselves. → The sequencing activity is included for making both a BLT (bacon, lettuce and tomato) sandwich with 'the works' and for a PB&J (peanut butter and jelly) sandwich. 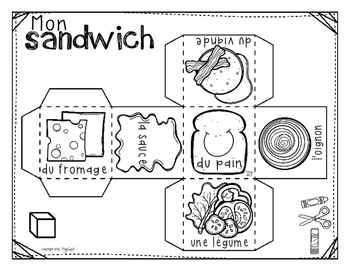 • Mon sandwich idéal - Write about and draw your favourite sandwich. • Roll-a-Sandwich Game - students will make a die to roll from the net included (cube). With a partner, they will take turns rolling and collecting items to put into their sandwich. The first player to have all the parts, wins! But watch out for the onion! 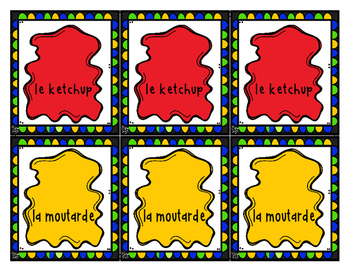 Colour game cards are included to print, cut and laminate for extended classroom use. Instructions are included in the file. • The dice could also be used to prompt a sequential writing activity - as they roll, students would write down what's in their sandwich. • 4 different designs of sandwich-themed writing paper. Use these to summarize the activity in numbered steps, short sentences, or paragraph form. Also a fun addition to your writing centers for recipes, poems and short stories. 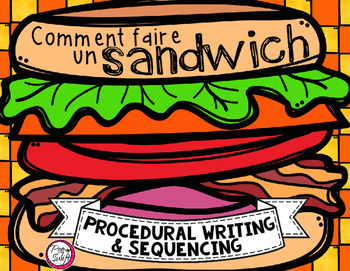 Check out the whole COLLECTION OF FRENCH PROCEDURAL WRITING & SEQUENCING ACTIVITIES! Your purchase entitles you to one (1) non-transferable, single-use license for one classroom only. Additional licences may be purchased for half the original cost by visiting the Teachers Pay Teachers ‘My Purchases’ tab → Buy Additional Licenses. Thank-you for respecting my work.